Japanese rock band The BOOM will perform its final show ever this December. The band’s recording company announced the news on March 30. The vocalist Kazufumi Miyazawa remarked, “All four members did what they wanted to do.” The members are continuing their own individual projects, including one that Miayazawa works on in Yomitan Village. The four musicians formed the band in 1986, debuting in 1989. 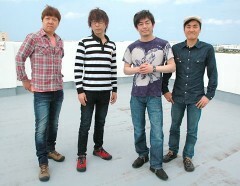 Inspired by the music of Okinawa, the band released single CD “Shima-uta” with high sales in and outside Japan. The band’s success with Shima-uta contributed to the nationwide popularity of Okinawan folk songs and sanshin. Miayazawa has halted his career since last November due to surgery of cervical spondylotic radiculopathy. The guitarist Hiromasa Yamakawa has been receiving medical treatment for type one diabetes since February. The band plans to go on a nationwide tour to mark the 25th anniversary of its debut. It plans to perform at the Naha City Hall on November 2.